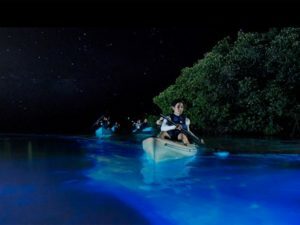 Nestled along the Caribbean coast is one of the the most stunning bioluminescent bays the world has ever seen. 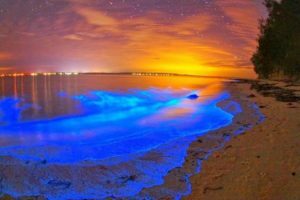 Mosquito Bay of the island of Vieques truly is magnificent as special micro-organisms thriving in the water give off a strong blue-green light color in the darkness of the night. So what specifically are these micro-organisms? 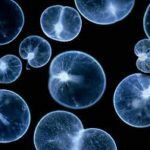 They are called dinoflagellates, unicellular microscopic species that glow when they are disturbed in the water. That means that any movement done by paddles or your hand will cause them to burst this blue-green light! So why do these dinoflagellates thrive particularly in Mosquito Bay? It is because the bay has the perfect environment for these special creatures. It is small and shallow and has a narrow opening to the Caribbean Sea. Therefore, the bay is protected from trade winds and huge waves that can wash these tiny organisms away. This is the reason thousands of dinoflagellates are confined and secured in the bay area. Bioluminescent bays are very rare to find in the modern times. In fact, there are only a handful of them known in the world today, and Puerto Rico is lucky enough to have three of them. The brightest among them is Mosquito Bay, fondly called biobay by the locals. This unparalleled brightness is attributed to the over 700,000 dinoflagellates living in each gallon of the bay water. Tours to the biobay are conducted by tour companies approved by the local government. It is important that tours are regulated properly as this special habitat is very fragile. The excursions are conducted every night except on a full moon because the micro-organisms are not visible then. The tour includes a bilingual guide who will talk about the ecology of the animals and plants living in the bay area. There may also be interpretive star lectures and a stop at an area where there is high bioluminescent concentration. Some tours are done onboard an electric double-pontoon boat; but others come on kayaks to preserve the quietness and serenity of the environment. There are even tour companies that include meals and drinks in their boat tour package. However, you always have the option to explore Mosquito Bay on your own. Bioluminescent Mosquito Bay is always under threat by natural and human interference. The local government is trying hard to enforce strict measures to protect this natural phenomenon. As tourists, you are expected to do your part in its preservation. It is important to understand that swimming is not permitted in the bay. Tour guides have the responsibility to remind you of this law. This is because any chemical that you normally put on your skin like soap, lotion or bug repellent can easily harm the ecosystem of Mosquito Bay. This is also means that you should refrain from throwing things into the water. Book tours only with licensed and approved tour operators who abide by the preservation laws. Experiencing the incredible glowing water of Puerto Rico’s biobay is truly a once-in-a-lifetime experience. So do your part in protecting it so it may be enjoyed by generations to come.